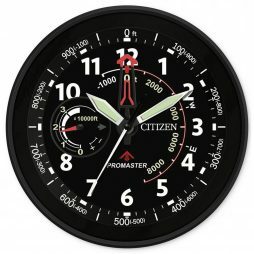 Citizen gallery circular black wall clock, molded 3D black dial with decorative sub eyes and red accents. Brushed hands with tip end and green luminous on top. Protective glass lens. Sweep second hand. This is the power adapter for the BNC010-SRC (Braun radio clock), BNC013 (Braun weather station) and BNC015 (Braun projection clock)*. 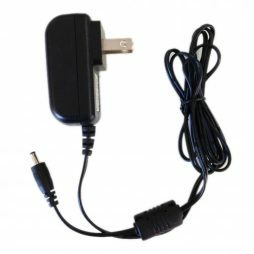 With this adapter, these clocks can be powered via mains output rather than the batteries. Use of the power adapter allows the backlight to be set for permanent illumination. The colorful balls in the thermometer rise and fall with changes in temperature as the crystalline structures in the storm glass change with passing weather systems. Know the temperature in Fahrenheit or Celsius with the Temp-A-Light Indoor/Outdoor Lighted Thermometer. 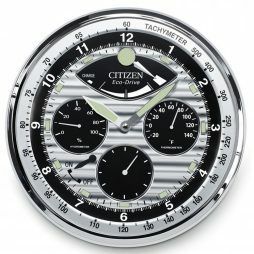 The dial automatically lights as the environment becomes darker, and the night time light turns off when the environment brightens. It features a champagne color, weather resistant case with a shatter resistant protective glass lens. The dial and case are sealed to keep out moisture and humidity. This thermometer has a coordinating Indoor/Outdoor Wall Clock C4826. When Italian mathematician and inventor Evangelista Torricelli invented the first barometer in 1643, he ushered in a new age of discovery which ensured that the weather could be predicted by measuring air pressure. 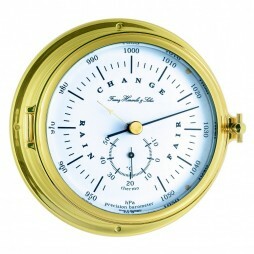 The importance of this ability during sea voyages ensured that the barometer soon became an essential instrument on board. Thermometers were not left out either since they were initially required to calculate barometer readings accurately. And even though computers have now replaced both instruments for the most part, they still remain relevant since they have been developed to accurately measure their required parameters. 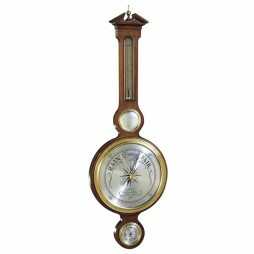 With the brass and crystal, Annapolis Solid Brass Case Ships Barometer and Thermometer, you too can get to experience the satisfaction of accurately predicting the weather or measuring the temperature with this special instrument designed specifically for use on a ship. 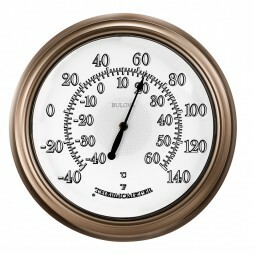 The Catalina Thermometer, Barometer and Hygrometer features a clock in addition to the other 3 devices. Constructed from select hardwoods and veneers and finished in Windsor Cherry, this multi-purpose piece features dials surrounded by polished and lacquered bezels and protected by convex crystals. 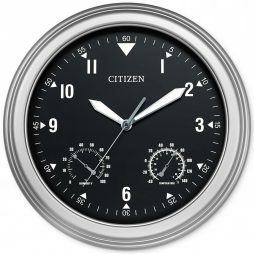 The clock features quartz, battery operated movement. 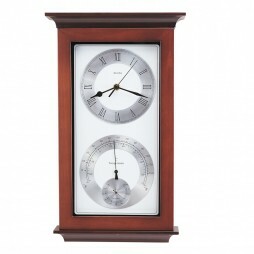 The Yarmouth clock/weather station is a perfect gift or a perfect way to commemorate engraver of your choice. 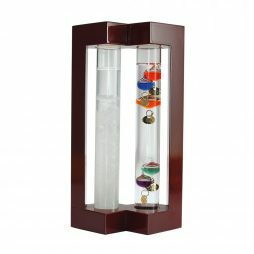 This unique piece includes a clock, hygrometer and thermometer in both Fahrenheit and Celsius scales. 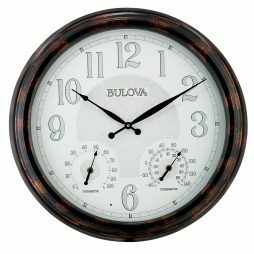 The two-tone wood finish includes a solid wood case in a walnut finish and solid wood top and base in a mahogany finish, with a white metal dial and spun aluminum chapter rings and protective glass lens. 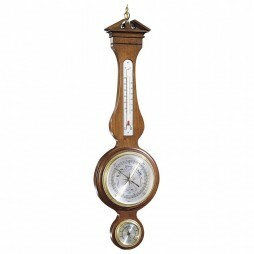 Constructed from select hardwoods and veneers and finished in Windsor Cherry, the Olympia Thermometer, Barometer and Hygrometer is a handsome multi-purpose piece. The long frame is accented by the 3 devices and the decorative frosted disk in the middle that provides balance. The dials are encircled by polished and lacquered brass bezels behind convex glass crystals. 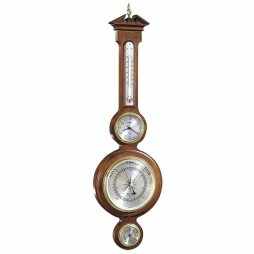 The Presque Isle Thermometer, Barometer and Hygrometer features all three devices housed in a handsome hardwood frame. The detailed dials are encircled by polished and lacquered brass bezels and protected by convex crystals. It is constructed of select hardwoods and veneers in a Windsor Cherry finish. Weather Station wall clocks are a great idea for a clock that provides time and weather information. For those who are keen to monitor the weather, having an ever ready display at hand will provide all the desired data. Perfect for any room, Weather Station wall clocks work both as a clock to read the current time, as well as a thermometer, and a hygrometer. They are best for places where proper temperature and humidity levels are crucial. A thermometer will provide the temperature in the room while a hygrometer measures the moisture content in the atmosphere, also known as the humidity level. The humidity sensor is most often mounted next to the temperature sensor to ensure correlation between temperature and relative humidity, which are then used to calculate the dew point. For work or play, these clocks are simply your ideal wall weather station. The hobbyist will enjoy noting the changing weather statistics. When the weather feels like it will soon rain, the hygrometer will confirm with a signal that never fails. 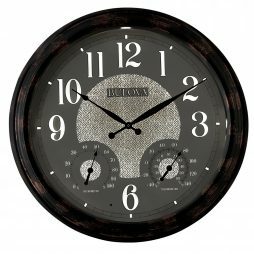 Our offerings in this category of weather station wall clocks include elegant models such as the wainscoting panel wood case which is finished with an antique coffee finish alongside a decorative molded bezel ring with an antique bronze finish. Others feature a solid wood case with black finish and Carbon-fiber patterned dial, a raised black chapter ring and contrasting white markers. 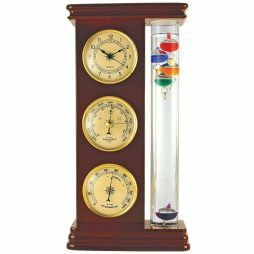 This model of weather station wall clock includes a thermometer with dual Fahrenheit and Celsius scales, and a hygrometer. 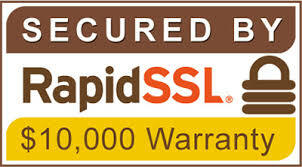 An engraving plate is also included. Regardless of your choice, any of the weather station wall clock will look smart in any home and give the feeling of a stylish wall weather station. The comfort of knowing the current time, temperature and dew levels is a classic function that every home owner would love to enjoy. 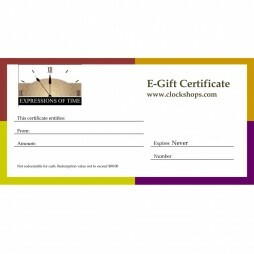 For a recreation room or greenhouse, living room or den, clockshoppes.com has the right weather station wall clock.